I really enjoyed trying to solve this mystery and Karen wrote it very well. It is funny, but also romantic and everything I was looking for in a contemporary mystery. 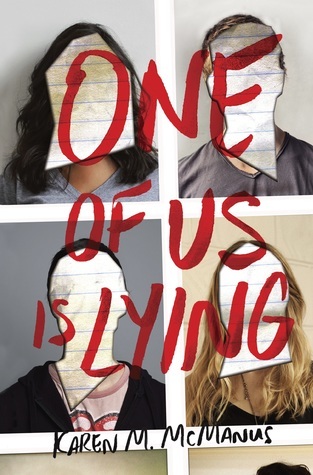 I give One of Us is Lying by Karen m. McManus five out of five hearts because I loved it. It was everything I wanted from it, funny, mysterious and a little bit romantic. It keeps the reader suspicious and is easily read. Around the middle of the novel I had two suspects and it turned out that one of them was right. It wasn’t because it was so obvious in the book, but because I was trying to eliminate while reading and keeping every option open. It didn’t bother me because it was just a suspicion, not actually knowing. The book ends with some things you really didn’t expect and I liked that a lot. The romance also wasn’t too obvious, just by the end, which is okay, I guess. The story is very modern with apps and mobile phones but also school and the annoyance of it. The characters are pretty much stereo types of high school, this made it easy to identify with them and each of them has a pov in the book. I was so suspicious that I thought that one of them was lying to themselves during their pov. Which is an interesting idea and kept me on the edge of my seat. I wanted to know how it end and what actually happened. Overall I think this book has a really great story. It deals with very interesting topics, like school shootings and but in an interesting way. I am already looking forward to Karen’s next book, Two Can Keep a Secret, which will be released January next year. So keep your eyes open. This entry was posted in Book Review and tagged Book Review, Contemporary, Karen M. McManus, Mystery, Romance, Thriller. Bookmark the permalink.